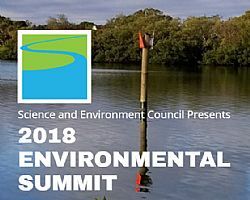 The Science and Environment Council of Southwest Florida (SEC) is once again facilitating a community-wide event to bring together area scientists, planners, managers, fishers, farmers, business people, students, elected officials, and the environmentally curious to connect, engage and activate. Our rich environmental legacy: can we connect it to our future? Are we on our way to restoring fishable, swimable waters? Science-Outreach-Advocacy-Lobbying: what’s the difference and how do we work together? What’s coming with climate change? Plastic, nutrient, and bacterial pollution: what’s the solution? It all kicks off with a Keynote Reception at Mote Marine Laboratory Wednesday evening April 25. Network and find inspiration at our Bayfront Reception Thursday evening April 26. Join the SEC email list for updates as the program develops! Learn more about sponsorships at the link below!